Diabetes mellitus, or simply diabetes, is a metabolic diseases in which a dog has high blood sugar, either because the pancreas does not produce enough insulin, no insulin is produced at all, or because cells do not respond to the insulin that is produced. The condition is commonly divided into two types, depending on the origin of the condition: Type 1 diabetes, sometimes called “juvenile diabetes”, is caused by destruction of the beta cells of the pancreas. The condition is also referred to as insulin-dependent diabetes, meaning insulin injections must replace the insulin the pancreas is no longer capable of producing for the body’s needs. Dogs have insulin-dependent, or Type 1, diabetes; research finds no Type 2 diabetes in dogs. Because of this, there is no possibility the permanently damaged pancreatic beta cells could re-activate to engender a remission as may be possible with some feline diabetes cases, where the primary type of diabetes is Type 2. There is another less common form of diabetes, diabetes insipidus, which is a condition of insufficient antidiuretic hormone or resistance to it. 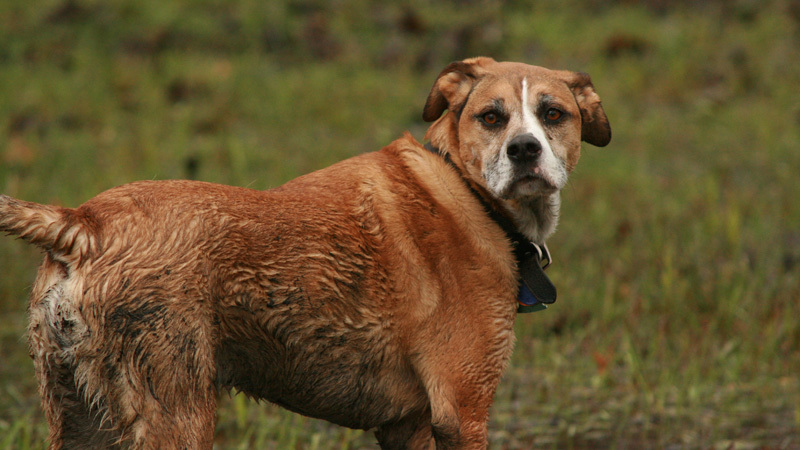 This most common form of diabetes strikes 1 in 500 dogs. The condition is treatable and need not shorten the animal’s life span or interfere with quality of life. If left untreated, the condition can lead to cataracts, increasing weakness in the legs (neuropathy), malnutrition, ketoacidosis, dehydration, and death. Diabetes mainly affects middle-age and older dogs, but there are juvenile cases. Although the typical canine diabetes patient is middle-age, female, and overweight at diagnosis any dog can have diabetes. It is possible that the illness may not be noticed until the dog has symptoms of ketosis or ketoacidosis. When newly diagnosed, about 40% of dogs have elevated ketone levels; some are in diabetic ketoacidosis when first treated for diabetes. Recently my dog was diagnosed with diabetes. She is almost 11 years old, she has become a very picky eater the only thing I can get her to eat is the w/d soaked in puppy milk. She has lost 7 lbs in two weeks which is a lot of weight for a 26 pound dog. Recently she started to urinate on herself it is not small puddles by any means, I have tried the doggie diapers, however she has bad hips so doggie diapers is not a good option. Do you have any suggestions on what to do? Her quality of life has declined tremendously. If your pup is declining I would get into the Vet as soon as you can. And if your Vet isn’t much help, find another Vet who will be. Has your Vet checked for other diseases too? Next, is your dog regulated? Are you checking you dog’s blood sugar regularly? If so, what are your dog’s glucose numbers? and what type and how much insulin are you giving your dog? I’m not a Vet but my guess is your dog isn’t regulated. When Bender was on W/D I could never get him regulated. His glucose levels would be different every day. Thus I’m not a fan of W/D. It has lots of corn which is not good for diabetic dogs. Corn = sugar, sugar equals high glucose levels. As soon as I switched food, I was able to get Bender regulated, his weight and glucose levels stabilized. Look into a high protein, grain free, preferably reduced fat food like Wellness Core Grain Free Reduced Fat. There are a bunch of them out there now. Foods like this will help keep your dog regulated. Which is the key to managing diabetes. Bender is on Wellness Core Grain Free Reduced Fat, as of late some days he isn’t very excited to eat so I add about 1/4 cup of warm water to his food and mix it. Smells really good and he eats it right up. I would go see your Vet, and get your dog’s glucose levels regulated, if they aren’t already. If not you will be constantly battling your dog’s diabetes.